On the night of the joyous festival of Shemini Atzeret of the Jewish year 5738 (October 4, 1977), while celebrating with thousands of his Chassidim in his synagogue, the Rebbe suffered a massive heart attack. Following that episode the Rebbe was confined to his office, and it was not until five weeks later, on the first day of the Hebrew month of Kislev, that he returned home. This date was duly designated by his Chassidim as a day of celebration and thanksgiving. The doctors had warned the Rebbe of a sixty percent chance re-occurrence if he continued his vigorous daily routine. But the Rebbe heard positive news: The doctors were of the opinion that there's a forty percent chance that there's nothing to worry about. 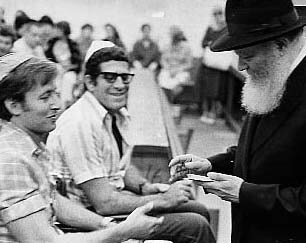 Two years earlier, in the summer of 1976, a group of disabled Israeli war veterans touring America on a program sponsored by the Israeli Defense Ministry came to the Rebbe. Ten large commercial vans transported their wheelchairs from their New York hotel to the Rebbe’s synagogue at 770 Eastern Parkway in Brooklyn. For several minutes the Rebbe walked among them, shaking hands, smiling and making light conversation. Then he addressed them, apologizing for his accented Hebrew. Indeed, the face that the Rebbe showed the men who had lost their limbs in the defense of their people was warm, cheerful and optimistic. A number of them later said that this was the first time since their injury that they were met with such a natural response from another person, rather than a look of pity, guilt or revulsion. But when the Rebbe returned to his room, his personal secretary saw how shattered he was by the encounter. It was a full week, the secretary later told, before the Rebbe recovered from the experience.